We are delighted that Professor Carol Brayne CBE will be giving this year's Anne Silk lecture. This lecture will take place at the Royal Society of Medicine, 1 Wimpole Street, London on the 18th of April from 6pm to 7.40pm. 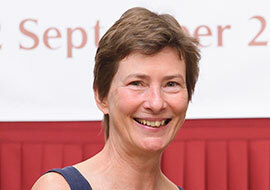 Professor Carol Brayne is a professor of public health medicine and director of the Cambridge Institute of Public Health in the University of Cambridge. She is a medically qualified epidemiologist and public health academic. Professor Brayne will discuss how we learn about brain ageing in health, including dementia. Furthermore, what we have learnt and how this fits with contemporary policy and practice. Professor Brayne will also explore future directions in the context of sustainable development goals. For more information and to register for this event, please visit www.rsm.ac.uk/anne-silk-lecture-2018.